Developed from widely used & stable Android Marshmallow OS, deeply customized & optimized to let it perform better in vehicles. Lots of vehicle-based features - Specific FM/AM Radio tuner w/ RDS, preset max 4*45W amplifier with higher 4*24w RMS power out, AUX/Backup camera/dash camera input, Bluetooth handsfree, steering wheel key control & more (no DVD/CD Player,however). Quick Booting - Start the car & access system within 2 seconds! Pre-Amplifier: Built-in Max 4*45W Amplifier with RMS 4*24W (Vcc=14.4v,THD=10%); Be aware that only emphasizing higher max power out does not make any sense, as RMS power out is the most acceptable and practical indicator (non-distorted audio) to tell its max performance for excellent daily listening! The double din size of ATOTO A6 series provide 4 types of front panel size as option: 173mm*97mm, 205mm*104mm(Toyota specific),8in VW specific, and Ultra 10.1inch, and their model name start as A6(Y)27xxxx, A6YTY7xxx, A6YVW8xxx and A6Y1021xxx. 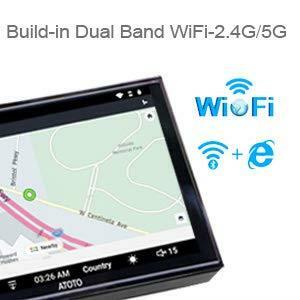 Most dashboard mounting frame suppliers from European market provide double din mounting frame with 179(~180)mm x 102(~103)mm opening (Connects2, Autoleads,etc). Some vehicles may also have only 174mm x 98mm dashboard opening, or over-sized 188(~189)mm x 116(~117)mm. So ATOTO A6(Y)2xxxx is the first one to bring Android 7in car stereo with minimum 174mm*97mm front panel dimension! Extra plast frames are also included in the package to extend A6(Y)2xxxx frame size from 173mm*97mm to 178mm*101.5mm & 188mm*116mm. No extra trimming/cutting job is needed any more! WiFi hotspot & Bluetooth Tethering Internet via phone data - Install Apps, Stream Online Music, Run Online Map Mavigation w/ Real-time Traffic! 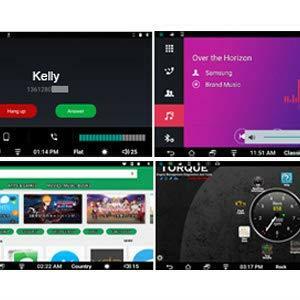 More than 300 apps from Google Play Store have been tested installable on ATOTO A6 Series, especially media/entertainment apps and apps in category of "Auto & Vehicles". Phone Pairing operation has been simplified to be like One Click And Then Connected Successfully (within 2-3 seconds)! With firmware updated to AICE OS 9.4, phone signal strength/battery power could be displayed on A6 notification bar!